Our ability to run, bicycle, ski, swim, and row hinges on the capacity of the body to extract energy from ingested food. A meatless diet does not guarantee good health and better performances. Your job beforehand is to respect the nutrition aspect of long-distance endurance competitions and eat in a way that prepares you physically and mentally for the challenge that lies ahead. Endurance Sports Nutrition will guide you in selecting the optimal foods, drinks, and supplements so you can train longer, recover more quickly, avoid injuries, and achieve your performance goals in any endurance endeavor. The third edition includes meal planning recommendations for vegetarian athletes and those with food allergies and intolerances as well as profiles, advice from elite endurance athletes, and strategies for avoiding the most common pitfalls of training. 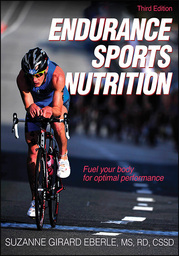 Endurance Sports Nutrition will fuel your best performance. Suzanne Girard Eberle, MS, RDN, CSSD, is a board-certified sports dietitian and Intuitive Eating coach who counsels active people of all shapes, sizes, and athletic abilities on mastering high-performance eating habits. She’s a lifelong carrot cake connoisseur, too. Girard Eberle’s first career was as an elite professional runner. She’s a USA Track and Field 5,000-meter champion with a mile PR of 4:28, and she represented the United States on three national teams. Today, she includes competitive road cycling and hiking among her favorite sports. Girard Eberle has reached the summits of Mount Blanc, the highest mountain in the Alps, and Mount Kilimanjaro, the highest mountain in Africa. In her next life, she plans to be a sport psychologist and further her passion of assisting disordered eaters and compulsive exercisers in reestablishing a positive relationship with food and their bodies. Girard Eberle lives and plays in Portland, Oregon, with her husband, John, and her whippet, Asa Babu.